What is the long-term nature of American foreign policy? This new book refutes the claim that it has varied considerably across time and space, arguing that key policies have been remarkably stable over the last hundred years, not in terms of ends but of means. 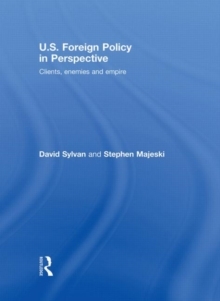 Closely examining US foreign policy, past and present, David Sylvan and Stephen Majeski draw on a wealth of historical and contemporary cases to show how the US has had a 'client state' empire for at least a century. They clearly illustrate how much of American policy revolves around acquiring clients, maintaining clients and engaging in hostile policies against enemies deemed to threaten them, representing a peculiarly American form of imperialism. They also reveal how clientilism informs apparently disparate activities in different geographical regions and operates via a specific range of policy instruments, showing predictable variation in the use of these instruments. With a broad range of cases from US policy in the Caribbean and Central America after the Spanish-American War, to the origins of the Marshall Plan and NATO, to economic bailouts and covert operations, and to military interventions in South Vietnam, Kosovo and Iraq, this important book will be of great interest to students and researchers of US foreign policy, security studies, history and international relations. This book has a dedicated website at: www.us-foreign-policy-prespective.org featuring additional case studies and data sets.